Prototype: Different farm machinery: 1 CLAAS "Lexion 580" harvester, 1 CLAAS "Jaguar 900" forage harvester, and 1 CLAAS "Ares" tractor. Model: 3 of each model type come in the package. All of the vehicles come individually packaged with a plastic base and a clear plastic cover. Prototype: 2 Bavarian design Pacific express locomotives. Original version of the Royal Bavarian State Railroad (K.Bay.Sts.B.) in a provincial railroad paint scheme. Postwar version of the German Federal Railroad (DB) class 18.4 with smoke deflectors in the standard red / black paint scheme. Model: Both locomotives have digital decoders and controlled high-efficiency propulsion. 3 axles powered. Traction tires. The 72270 smoke generator can be installed in the locomotives. The headlights and the smoke generator contact will work in conventional operation and can be controlled digitally. The acceleration and braking delay can be controlled with a 6021 Control Unit or with Märklin Systems. The metal locomotive frames are partially open with separately applied details. Length over the buffers for each locomotive 24.9 cm / 9-13/16". An attractive pair: the beautiful S 3/6 from two eras. Locomotive frames and bodies constructed of metal. Digital decoders and high-efficiency propulsion included. Each locomotive comes individually packaged. 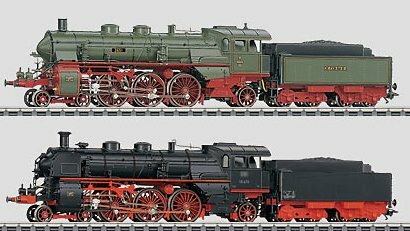 Prototype: Grand Ducal Baden State Railways class IV h steam locomotive, 4-6-2 wheel arrangement. Built starting in 1918. Use: Premium passenger service. Model: The locomotive has controlled, compact design, high-efficiency Softdrive Sine propulsion with an mfx digital decoder and a sound generator. 3 axles powered. 2 traction tires. The tender is constructed of metal. There is a close coupling between the locomotive and tender that can be adjusted for the radius of your curved track. A 72270 smoke generator can be installed in the locomotive. The LED double headlights change over with the direction of travel. They and the smoke generator that can be installed in the locomotive will work in conventional operation and can be controlled digitally. 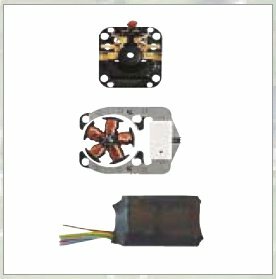 The acceleration and braking delay, the locomotive whistle sound, and steam locomotive operating sounds, the sound of the compressor working, the sound of brakes squealing, and a short whistle blast for switching maneuvers can be controlled with a 6021 Control Unit or Märklin Systems. Three additional sound functions (the sound of steam being let off, the sound of coal being shoveled, and the sound of the grate being shaken) can be controlled with the 60212 Central Station. There is a close coupler with an NEM pocket and a guide mechanism on the tender. Minimum radius for operation 360 mm / 14-3/16". Length over the buffers 26.7 cm / 10-1/2". Operating sounds that vary with the speed and that are synchronized with the wheels' rotation. Prototype: 5 different design privately owned cars painted and lettered for the "Compagnie Internationale des Wagons-Lits / International Sleeping Car Company" (CIWL). 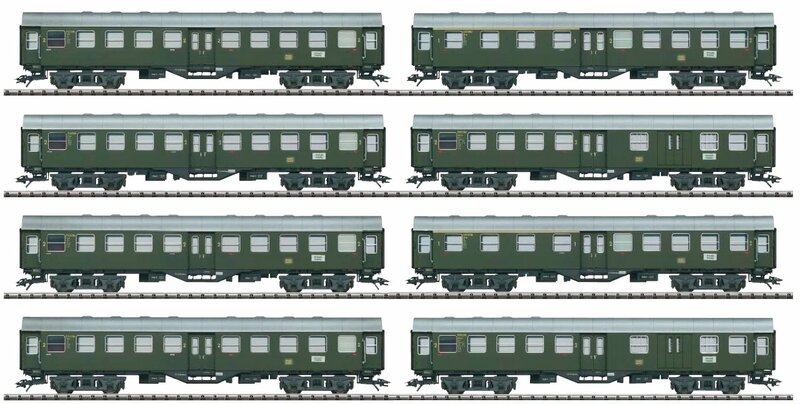 2 each baggage cars in a brown paint scheme, 1 sleeping car in a brown paint scheme, 1 sleeping car in a beige/brown paint scheme, and 1 dining car in a beige/brown paint scheme. The cars look as they did in the spring of 1921. Model: The models are finely constructed with many separately applied details. The cars have different color interiors. They also have different car numbers. Retracted diaphragms with raised walkover plates are included for the end cars. All of the cars have factory-installed interior lighting and all of the cars have factory installed current-conducting couplers. There is a pickup shoe on one baggage car for picking up power. Total length over the buffers 117.5 cm / 46-1/4". Orient Express – Orient and Occident Deluxe. The linking of the West with the Ottoman Empire by rail was an ambitious project of the countries and railroads participating in it. Probably the best known connection that still appears in train routings is the Orient Express. The history of this famous train began on June 5, 1883 at the Gare de l’Est in Paris. The "Compagnie Internationale des Wagon-Lits" (CIWL) or "International Sleeping Car Company" sent its luxurious overnight train east for the first time. The rail connection went initially as far as Rumania, and passengers had to go the rest of the way to Istanbul by ship. In 1888 it was then complete: Istanbul was connected by ties and rails to the West. This fast connection between the Orient and the Occident was not only keenly embraced by business travelers, the elegant clientele from the ranks of the high nobility and financial potentates also took great delight in the almost unlimited comfort, in the exquisite catering, as well as the exciting entertainment in the dining car during the long trip. The rolling stock consisted of first class baggage, sleeping, and dining cars that were at the highest technical standard for that time. The paintwork for the cars was in an elegant brown or beige/brown, and the golden coat-of-arms with the two CIWL lions had to be on every car. This train soon became a symbol of luxury and the guests on board considered it an honor to travel on this train. The participating state railroads also considered it an honor to have the train in their rails and provided motive power for the train that was the most beautiful, most powerful locomotives they had under steam. In the German Empire this was primarily a Bavarian S 3/6 and the Baden IV h, both of them extremely elegant units and motive power worthy of the Orient Express. The First World War interrupted the connection between Paris and Istanbul for several years and after the end of the war the Orient Express was used as a purely military train. But, it was then made accessible to the public again. However, the train's run ended in Bucharest; hardly anything had changed however in the comfort of the prewar years. The CIWL was able to offer the Orient Express as a pure luxury train until 1940, when the events of World War II brought the train to an abrupt halt. The political separation of Europe into a West and an East block and the lean reconstruction years caused great limitations in the service offered as well as in the train's routing. For a while the train ended in Vienna, Budapest, or Bucharest, and the Orient Express was run as a normal express train with all classes of cars. The name Orient Express can still be found today in international train connections; it even runs on part of its traditional route. But, only the name remains of the former luxury of the overnight trains of the "Compagnie Internationale des Wagon-Lits" (CIWL), often envisioned in movies and books, and contributing to the preservation of the mystique of the Orient Express. This is the ideal car set to go with the Baden IV h express locomotive with a tender, item no. 39021. A prototypical reproduction of the famous "Orient Express" as it ran between Paris and Istanbul is possible with the two express train passenger car sets, item nos. 42755 and 42760. Prototype: 2 privately owned cars painted and lettered for the "Compagnie Internationale des Wagons-Lits / International Sleeping Car Company" (CIWL). 2 sleeping cars in a brown paint scheme. The cars look as they did in the spring of 1921. Model: The models are finely constructed with many separately applied details. The cars have different color interiors. They also have different car numbers. The cars have extended diaphragms. Both cars have factory-installed interior lighting and factory installed current-conducting couplers. Total length over the buffers 48.5 cm / 19-1/8". Prototype: 1 type litra Ca 1029 passenger car and 1 type litra Car 1049 with "Restaurant", painted and lettered for the Danish State Railways (DSB). Brownish red basic paint scheme. The cars look as they did around 1974. Model: The cars are finely imprinted on their sides. Total length over the buffers 49.6 cm / 19-1/2". Prototype: 1 type litra A passenger car, 1st class, and 1 type litra B passenger car, 2nd class, painted and lettered for the Danish State Railways (DSB). Red basic paint scheme. The cars look as they did around 1990. Model: Both cars are ready for installation of the 7319 current-conducting coupling or the 72020 / 72021 current-conducting couplers. Total length over the buffers 52.8 cm / 20-13/16". 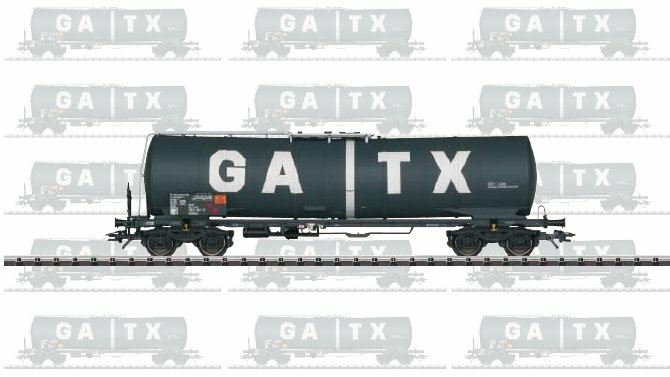 Prototype: 2 privately owned tank cars lettered for VTG, Vereinigte Tanklager und Transportmittel GmbH / United Tank Farm and Transport, Inc., Hamburg, Germany. One car with a brakeman's platform and brakeman's cab, and one with only a brakeman's platform. "Storck Karamellen" large format design on the cars. Used on the German Federal Railroad (DB), with user markings DR Brit.-US-Zone. MB type L 6600 box truck with a box trailer. The cars and truck look as they did around 1950. Model: The platforms and ladders are separately applied. The cars have different car numbers and lettering. Total length over the buffers 20.4 cm / 8-1/16". The truck model is painted and lettered for "Storck Karamellen". Prototype: German Federal Railroad (DB) type Bt 10 flat car with a brakeman's platform, for containers. Loaded with 3 type Efkr Pa containers for fine bulk material. Model: The car is painted and lettered in a Märklin Magazin design. The car has separately applied destination boards. The containers are removable and have different registration numbers. Length over the buffers 11.4 cm / 4-1/2". The car comes in a special "Looney Tunes" design. The end platforms are made of metal. The car has Relex couplers. Length over the buffers 11.5 cm / 4-1/2". A ruler with the theme "Roadrunner" in lenticular technology is included with this car. Annual Car for Members in the 1. FC Märklin. DC wheel set 2 x 700580. Due to licensing legislation, this model is available exclusively in the following countries: Germany, Austria, Switzerland, The Netherlands, Belgium and Luxembourg. Prototype: 2 German Federal Railroad (DB) type Bt 10 flat cars with brakeman's cabs, for transporting containers. Each car loaded with 3 type Efkr Pa containers for fine bulk materials and foodstuffs, lettered for "Birkel Eier-Nudeln". Magirus "Merkur" curved hood truck with a special flatbed. Model: The cars have separately applied destination boards. They also have different car numbers. The containers are removable and have different registration numbers. Length over the buffers 22.8 cm / 9". The truck model has a metal body. This is a bracket made of metal for mounting a 74151 single hanger arm on the 74142 tower mast. The bracket has 4 easily bent tabs for mounting the bracket on the mast. A package comes with 5 pieces. Prototype: Standard design German Federal Railroad (DB) cradle bunkers. 4 reservoirs, each for 20 metric tons of coal, integrated into a steel framework design. 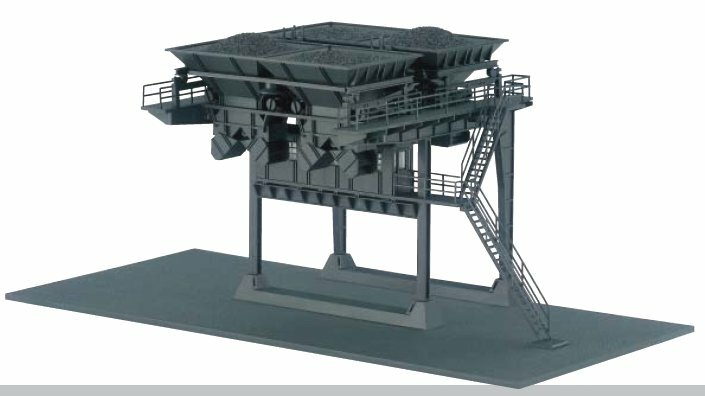 Model: The kit is detailed coaling equipment for expanding the 76510 large coaling station or for independent use with a suitable clamshell crane. The base plate and superstructure are made of sturdy plastic with many separately applied details. The cradle bunker has 4 bunker compartments and bunker hatches that can be opened. There is a cab and 2 work lights that light up. The bunker spacing is the same as a track spacing of approximately 64.5 mm / 2-9/16". Base dimensions approximately 300 x 130 mm / 11-13/16" x 5-1/8". Suitable addition for the 76510 large coaling station. Can also be used by itself with a separate clamshell crane. More Coal at the Locomotive Maintenance Facility. At the height of the steam locomotive era there were large, central locomotive maintenance facilities, where the locomotives were handled as if on an assembly line. At the end of the steam locomotive era the maintenance activities were concentrated into a few locomotive maintenance facilities that were even expanded for the purpose. Fast handling was achieved with several cradle bunkers arranged on parallel tracks one behind the other. Powerful clamshell cranes and appropriate switching of freight cars on the coaling track were a requirement for smooth operation. One reservoir was enough for about two to three loads of coal for tenders on road engines. As an example, the two locomotives for "Long Henry" were ready in several minutes for a run. The 76510 large coaling station is expanded to 8 cradle bunker reservoirs with the 76511 expansion. The crane track can be lengthened further with the 324072 base plate, which is available separately. Set consisting of a roller test stand and an information display unit. This is a test stand for servicing and presenting locomotives with up to 8 coupled driving wheels. It is ideal for models such as the class 03, class 41, and the Mikado. The superstructure is made of anodized aluminum shapes. Three adjustable pairs of roller brackets with precision ball bearings are included. C Track sections are included for positioning non-powered axles. Locomotive power connections for conventional transformers, Delta, the Digital Systems are present. The center conductor is removable in the roller area. The running rails can be separately connected so that the unit is also suitable for two-rail locomotives. Up to two 78110 pairs of roller bracket can be added to this roller test stand. Dimensions 400 x 42 x 30 mm / 15-3/14" x 1-5/8" x 1-3/16". A measurement device is included for installation on the roller test stand. It enables you to measure the duration of operation for the locomotive / powered rail car, the route length, and the speed. A special pair of roller brackets is included with measurement generators and connections to the information display unit with an LCD display. The scale of the model, the units to be measured, and the measurement areas can be selected. 3 type AA / LR6 batteries (not included) are necessary to operate this unit. 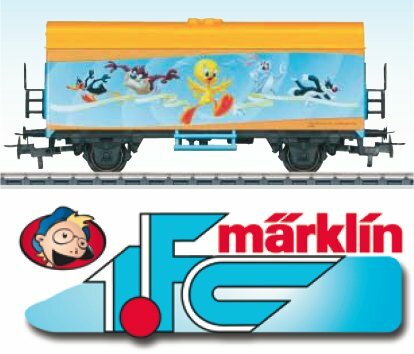 This is for extending the Märklin roller test stands by 40 cm / 15-3/14". It can also be used by itself as a presentation base. It is ideal for models such as the class 03, class 41, and the Mikado. The superstructure is made of anodized aluminum shapes. C Track sections with removable end pieces, including an adapter piece of track for extending a roller test stand, come with this extension. Dimensions 400 x 42 x 30 mm / 15-3/14" x 1-5/8" x 1-3/16". Prototype: Mercedes Benz tractor truck with a tank trailer, painted and lettered for the firm ARAL. Model: The body for the tractor truck and the trailer are made of die-cast metal, and the floor is made of sheet steel. The king pin on the trailer can be snapped into place on the tractor truck. The metal wheels are turned parts with rubber tires. The truck cab roof, the bumpers and the headlights are set off in color. Length approximately 18.0 cm / 7-1/16". Reproduction of a classic: The tank truck in blue and white from the Sixties. Reproduction manufactured from the original tooling for the earlier model, item no. 8032. Packaging in an historic design. The 18032 "ARAL" tank truck is being produced in a one-time series in 2008 only for Insider members. This vehicle and the packaging are permanently marked as reproductions. Prototype: French State Railroad (ETAT) class 231 express locomotive with a tender and a train composition of cars from the International Sleeping Car and Dining Car Company (CIWL). 2 sleeping cars, a dining car, a parlor car, and a baggage car. Model: All of the driving wheels on the locomotive are powered. The wheel flanges and the valve gear are dark nickel plated. The cars are lettered in different languages. Train length over the buffers 638 mm / 25-1/8". Prototype: 3 different Royal Prussian State Railroad (KPEV) freight cars. 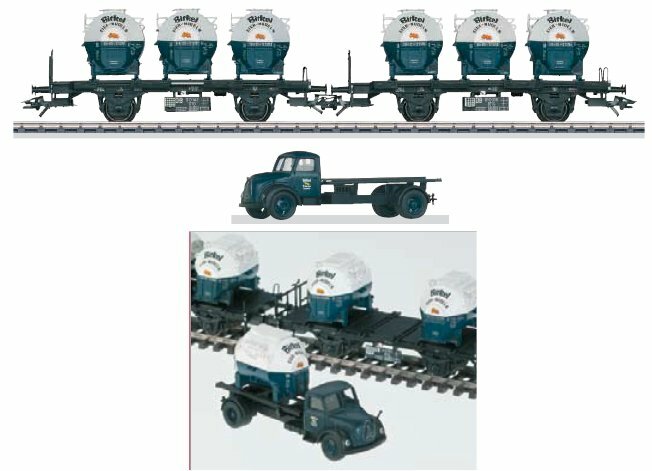 Model: The set has 1 beer car with a brakeman's cab, lettered for "Patzenhofer", 1 gondola with hinged roof hatches and a brakeman's cab, and 1 boxcar with a brakeman's cab. All of the cars have dark nickel plated wheels. Total length over the buffers 119 mm / 4-11/16". Prototype: Royal Prussian State Railroad (KPEV) class T 16.1, later the German Federal Railroad (DB) class 94.5. 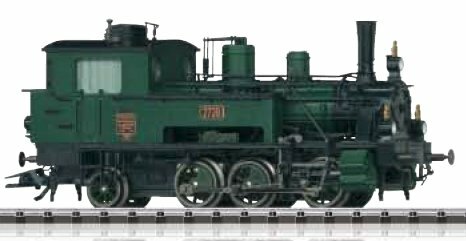 Model: The locomotive has a 5-pole motor. All of the coupled driving wheels are powered. The wheels and valve gear are dark nickel plated. Length over the buffers 62 mm / 2-7/16". The set consists of 10 vehicles based on prototypes from the Economic Miracle Period. 2 Citroen 2 CV, 1 BMW 501, 1 Mercedes 170, 1 Mercedes 220, 2 VW busses, 1 DKW small truck, and 2 VW Beetles. Single-piece, fine metal construction. 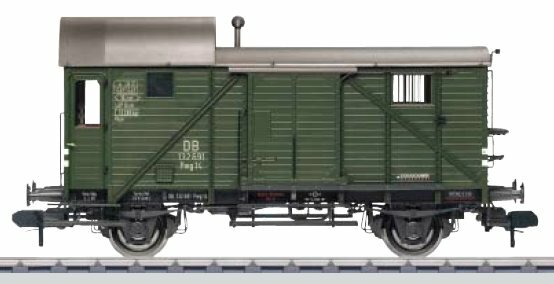 Prototype: German Federal Railroad (DB) type Pwg Pr 14 freight train baggage car. Model: The frame and car body are made of high quality plastic with many separately applied parts. The car has a highly detailed interior. It also has built-in digital lighting. The doors can be opened. The minimum radius for operation is 1,020 mm / 40-3/16". Length over the buffers 26.5 cm / 10-7/16". Prototype: German Federal Railroad (DB) type Ommi 51 dump car. Model: The main frame and the upper side sills with supports are made of metal. The rest of the parts are made of high quality plastic. The car has a realistic reproduction of the grating. The minimum radius for operation is 1,020 mm / 40-3/16". Length over the buffers 28.5 cm / 11-1/4". Prototype: German Federal Railroad (DB) type Ommi 51 dump car with a brakeman's platform. 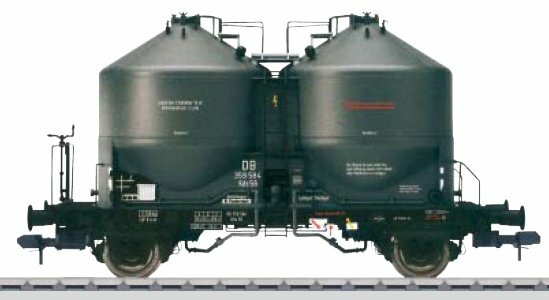 Prototype: German Federal Railroad (DB) type BTms 55 container transport car loaded with 4 type Efkr pa containers for fine bulk materials and food stuffs. Model: The 2-axle container transport car has a catwalk and no hand brake. The car's frame is made of die-cast zinc. The car has many separately applied parts made of high quality plastic. It comes loaded with 4 removable containers lettered for "Roßberg". The containers have separately applied details and different registration numbers. The minimum radius for operation is 1,020 mm / 40-3/16". Length over the buffers 34.4 cm / 13-9/16". Prototype: German Federal Railroad (DB) type Kds 56 powdered freight silo container car with a brakeman's platform. Model: The car's main frame is made of metal. The buffer boxes, grab irons, and hand rails are made of brass. The car superstructures and numerous separately applied details are made of high quality plastic. The minimum radius for operation is 1,020 mm / 40-3/16". Length over the buffers 26.5 cm / 10-7/16".